I wanted to like this novel, because the history rings true and the characters are sympathetic, but ultimately the main character is just too passive, only ever really doing things others have set up for her, and not following through even when she does have interests outside the laid-out-path. Luckily for her, even the people she doesn’t particularly like only ever seem to push her into what’s likely to be best for her. Basically, it’d be a very sweet family history to retell and read, but really doesn’t have enough going for it as a novel for me to want to read it again. I didn’t even much like her by the end. In summary, Eilis is the younger daughter of an Enniscorthy family of five in the early 1950s. Her three brothers have all gone to England to work, while her elder sister Rose, the only member of the family to have found a decent job at home, keeps her and their widowed mother. Eilis is doing some bookkeeping classes, but hasn’t found a job. At the beginning of the novel she is out-of-the-blue offered a few hours work in a local shop (Eilis is never proactive), and then a few months later Rose arranges for her to be offered a job in Brooklyn via a parish priest there while he’s on holiday home in Enniscorthy. Father Flood not only arranges her job and accomodation, he looks after her all the time she’s in New York, first suggesting she continue with her bookkeeping/accountancy training, then taking her to register for night classes when she hasn’t got the gumption to do so. Seeing that she hasn’t made friends or family connections he gets her volunteering in church events, and checks out the young man she meets at the Friday night dances he’s arranged in the church hall. Not that I’m complaining about that – Father Flood is a caring gentleman who looks after his parishioners – but it would have been nice to see Eilis actually grow a bit. So things go well in Brooklyn, and then Eilis gets temporarily called back to Ireland, and the question is, will she be able to say she wants to go back to New York, or will she get dragged back into small town life? It came to my notice that Bookmooch has its own system of travelling journals, or books that a self-selecting variety of contibutors create sequentially, and since there were a few available here in Israel, (so that it’d arrive faster and take one point rather than two) I thought I’d try getting one, to see was I interested in doing any more, before making a big(ish) commitment of time and effort while looking after a small baby. Well, that first one, The Literary Guild Reader’s Journal, arrived today, and it really didn’t take me long to read all the previous entries and add my own, so it’s now relisted and available to other Bookmoochers! It’s a collection of contributors’ lists and descriptions of favourite books, and musings on preferred authors, and I enjoyed adding a few pages of my thoughts, so I’ve mooched a few more journals that were local. If those go well I’ll have to go for some that are overseas. We’ve been given a set of gorgeous board books to read to our baby, which we’re enjoying doing! She’s not really ready to pay attention or to get the idea of stories or anything (she’s only just over a month old, after all! ), but there’s only one way for her to learn, right? Oh, I’m adding these to my reading list, so I can review them, but will obviously only do so once in a given year. The fact that they’ll likely get read umpteen times each validates that, I think. I may end up waiting awhile to review them in 2011, so I can give some approximation of DD‘s reaction, while the response now is entirely mine (and sometimes DH‘s). 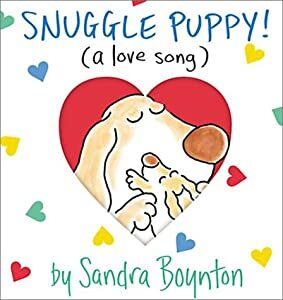 The pictures show an anthropomorphised adult dog and puppy – thus the name of the book – but ‘snuggle baby’ fits the rhythm just as well, for anyone who’d prefer to recite it to their child that way. 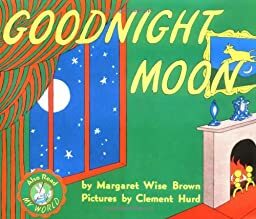 For something so very statedly a bedtime book, this is very active in both theme and rhythm (not to mention the suggested actions). It’s very good fun, however, and I can imagine many toddlers finding the pictures hilarious. I also guess that not every child or every evening is suited to the calming, soothing tale or poem. 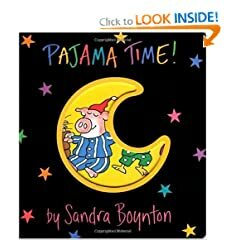 I hadn’t come across Sandra Boynton myself before we were sent these three books, but I’d happily look out for more of hers, going by these two. The illustrations are great, and fit perfectly with the text (as one might expect of an author-illustrator), and there’s lots to appreciate for both adult and child. This is definitely one of the quiet, soothing type of bedtime books. It’s also the only one we have so far that is fully in prose, and because of that I sometimes try to fit a rhythm to it, unsuccessfully until now at least! 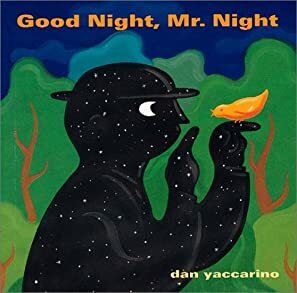 Unlike the others, it’s told in the voice of the child recognising that night has come, and it’s time for the world to sleep, until morning comes, when Mr Night will sleep instead. We received this one today, when I was already halfway through the draft of this post, but it certainly fits, as another beautiful board book that I hope (and expect) our DD will greatly enjoy in a short while. It certainly looks to be a classic (first published in 1947) for good reason. I had heard of it, of course, but I don’t think I’d come across it directly myself. I’m getting the impression being a parent is going to be a really great excuse to appreciate the best of old and new books for young children! I read and discussed this book back in 2008 and part of what interests me, as always, is how the context of other things I’m reading, doing, and thinking about affects my perceptions of a current book. 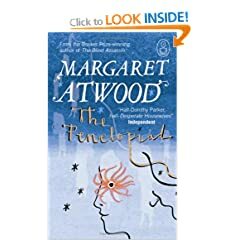 Unfortunately I’ve forgotten some of what I meant to say about it this time, but I was much more focussed on Homeric literature this time, and how Atwood fit in with the tradition or not. Perhaps because of that, I noticed the modernness much more this time. Homer it’s not, but it’s not really trying to be, either. I still enjoy it, a lot. 52. Katie the Kitten. 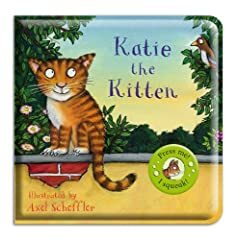 Illustrated by Axel Scheffler. My baby is two weeks old now, and she’s gorgeous, of course. I haven’t got a whole lot of reading or crafting done lately, though, let alone blogging! Still, we did just join BookMooch.com, since we have a largish bag overflowing with books weeded from our shelves that we haven’t got around to taking to a second-hand bookshop anytime in the last several months, and this seems like it might work for us. Hopefully so! Above are pictured some of what we’re giving away at the moment – for a variety of reasons. In many cases we liked the book, but don’t expect to read it again any time soon, so want to save the space on our shelves.